What happened? Something ignited a leak of natural gas from an underground transmission line that something had ruptured. The somethings are under investigation by the California Public Utilities Commission and the National Transportation Safety Board. 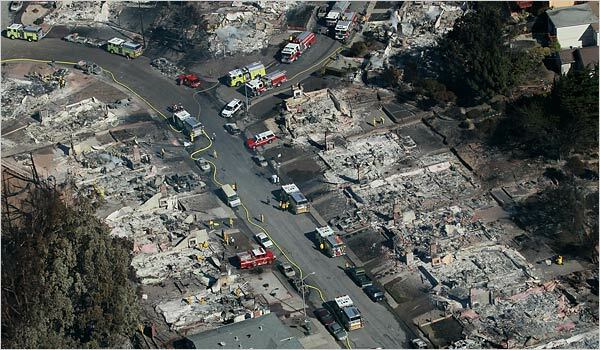 A comparison of before and after aerial photos show the massive level of devastation caused by the gas explosion and fire in San Bruno (See below and click on photos to enlarge). Vulnerability: Transmission lines ship natural gas from source locations to the distribution networks which deliver the gas to homes. Because these pipes carry lots of gas under high pressure, ruptures or cracks caused by fatigue and corrosion can release lots of gas. Unfortunately, many high pressure lines run through populated areas. The 30-inch transmission line which exploded in San Bruno, installed in 1956, was made of steel. Old steel is very risky. It’s rigid – not flexible and cracks – and is also corrodible. 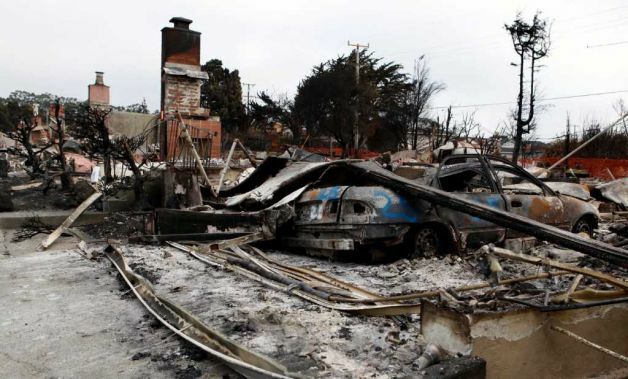 In addition PG&E was not able to inspect the line using the most reliable “smart pig technology” – robots that tunnel through the pipes and detect corrosion and cracks.To make matters worse, PG&E was exceeding its own maximum pressure limits in the line – this according to federal investigators. Could it happen where you live? 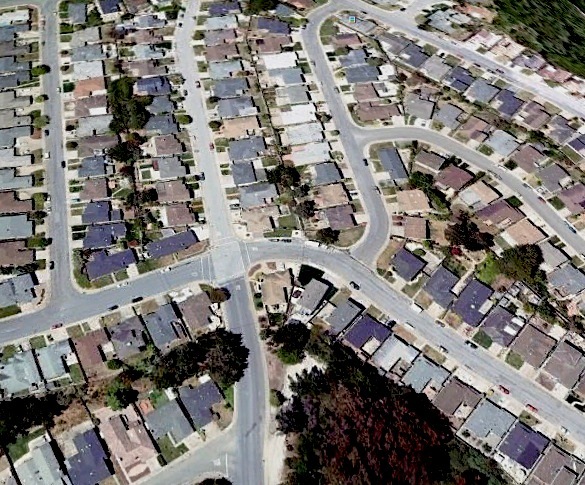 In the aftermath of the San Bruno disaster, communities and local governments around the country are expressing concerns about the location and safety of high pressure gas transmission lines in their own neighborhoods. The concerns are real. 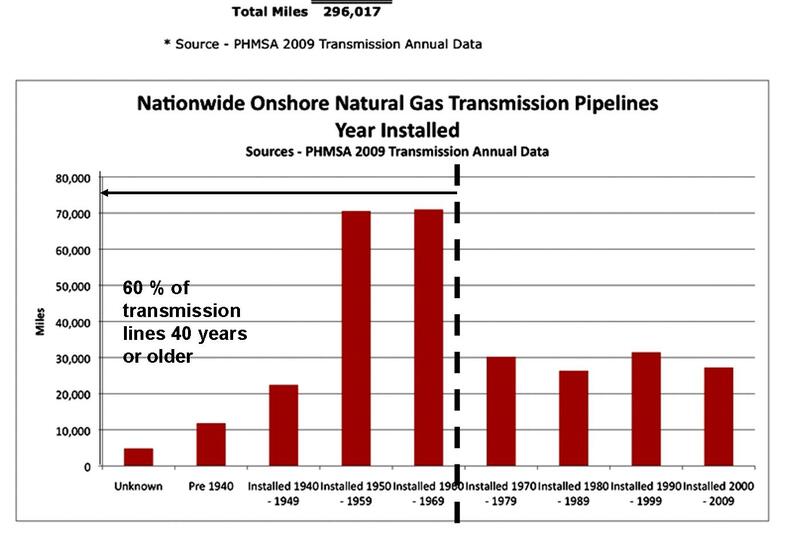 The graph (link) shows that some 60 percent of the natural gas transmission line mileage in the U.S. is at least 40 years old – i.e. subject to deterioration. Many run through populated areas. The total mileage is nearly 300,000 miles. Accidents also occur in the distribution lines that deliver gas from the transmission lines directly to homes. Click graph to enlarge. What about Hyattsville? Our July 26 post, 2010 focused on the densely populated residential neighborhood of Hyattsville, Maryland. Here hundreds of homes, townhouses and a nursing home are located just across Chillum Road from a Washington Gas Company (WGC) facility. The site formerly housed two large natural gas storage tanks and continues to serve as the hub for one or more high pressure transmission lines. More than 3,000 people live within 2,000 feet of the site. Residents have complained of repeated gas odors. The neighborhood and facility are shown in the following Google Earth image. The LNG Proposal: In recent years, the Chillum community and local jurisdictions have been fighting WGC’s proposal to install a large Natural Gas (LNG) production and storage facility at its Chillum Road facility. Maryland PSC: Step up to the Plate: Ekos-squared urges the Maryland Public Service Commission (PSC) to drop any further consideration of the LNG proposal for the Chillum neighborhood and instead focus on determining the safety of the current facility and transmission lines. Residents report that the transmission line may be 80 years old. They also told us that the frequently smell gas in the neighborhood. The San Bruno disaster should give the Maryland PSC and elected officials the impetus it needs to carry out a full investigation of transmission lines in populated areas including the Chillum Road area of Hyattsville. Then it must order Washington Gas to take all necessary measures and precautions to prevent an explosion with disastrous consequences. PSC and Washington Gas should provide the community answers to many questions; here is a preliminary list. 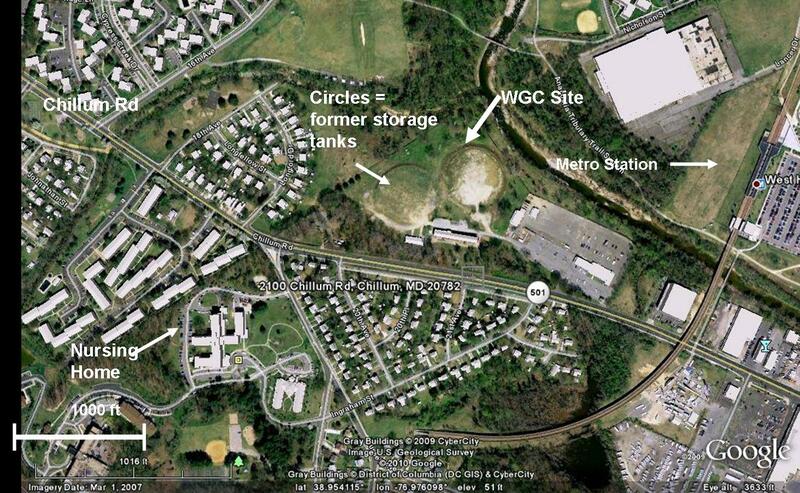 What are the current uses of WGC’s Chillum Road facility? What risks are associated with these uses and what precautions are in place. How old are the key items of equipment at the facility. When is the last inspection that PSC conducted there? How many transmission lines operate in the Chillum Road area? How old are these pipes? Diameters? Of what material(s) are the pipes made? At what pressures do they operate? Have any of the older lines been replaced? How often are the active transmission lines inspected by MD PSC? What problems, violations, and/or citations have the Commission issued to WGC? Have any fines been assessed? What corrective actions have been taken? Do any issues remain unresolved? Has the PSC made an independent assessment of the condition of the transmission lines (and distribution lines) in the area? Has it attempted to establish whether there have been problems with cracks, holes, corrosion or leaks in the pipes? Has WGC used current “smart pig technology” to determine the condition of the transmission lines? If not, why not? How many inspectors does the PSC to examine Maryland gas transmission lines? How many miles of pipeline? We urge PSC and local elected officials to initiate an investigation needed to and other vital questions; the process and results should be fully accessible to the public. Potenzmittel: Well, not exactly applicable — but a wonderful Papa Hemmingway quote; thanks; I’ll take it to heart. Editor’s note: Curtis Gray, Jr. was a former inspector for the Washington Gas Company and a whistleblower. 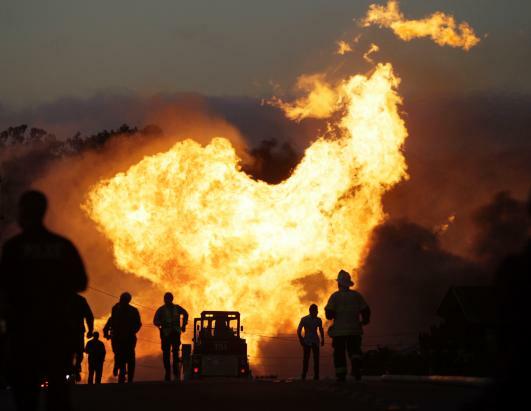 It’s shameful when regulators don’t take the issue of gas line safety issue — especially after the San Bruno explosion. Last week I notified the Washington DC Public service commission about dangerous gas leaks Washington Gas has not repaired. They were rude condescending and uninterested in public safety. Thank you so much for this blog entry and map illustrating the danger to our neighborhood. As a resident of Avondale, I am more than concerned. As a resident with an infant daughter in daycare within 2000 feet of the proposed LNG facility . . . I am outraged. 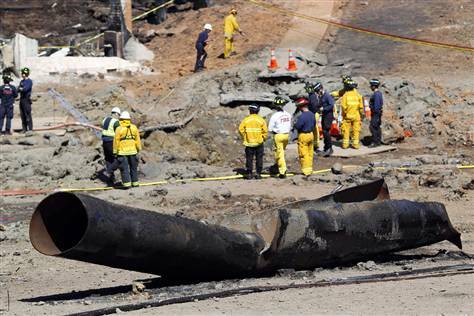 This problem is nothing new, The Gas companies are required to report leaks on transmission lines. When they do there is a procedure that they have for critical areas. Among those procedures is to expose and visually inspect that gas line. So rather than do that which is expensive they ignore the leak or do the repair and do not notify the authorities in our area that would be the public service commission. In my experience, public service commissions often ignore serious problems in the gas system when reported. Many former employees of the Md. public service commission now work for Washington Gas. Great commentary. May I suggest that it is but an example of a greater problem underlying our economy: economic infrastructure (in living, constructed and mental systems) deteriorates and must be maintained. After WWII the Greatest Generation led us and developed economic infrastructure including the national highway system and a first rate education system. To do this they paid much higher taxes (funding public infrastructure) than we do today, saved (funding private infrastructure)and put off discretionary consumer expenses. For the last 30 years we have lowered taxes and indulged as consumers while neglecting to maintain all the infrastructures on which our economic wealth depends. (Free Trade even allowed the destruction plant and educated workers in return for cheaper foreign made consumer goods funded by borrowing.) Corporations are led by people, who with the same mentality, discovered they could improve the bottom line and fatten their bonueses by neglecting to maintain existing infrastructure and not building new. The long term key is to rebuild the mental infrastructure… the obvious benefit is increasing the skill levels of people entering the workforce and people conditioned to work in place for 8 hours a day. The greater benefit, if education’s full value is properly understood… is to supply society with people who overwhelmingly support the best interests of the economic system as a whole and the political system as a whole. Just as the smooth flow of transportation requires the overwhelming support of drivers for traffic laws lightly reinforced by legal sanctions, so too does the economic system require the overwhelmning voluntary support of an educated populace, lightly reinforced by the legal system. We’ve been educating ourselves and our progeny to self indulge rather than self discipline; part of that is the unbalanced focus on “rights” without the balancing focus on “obligations”. The idiots that run PG&E are not unlike the rest of us. They benefitted by focusing on their personal bonuses rather than their obligations to reinvest in the future. It’s not hard to cross the dots between gas line eruptions, oil spills, mining disasters below ground , and strip mining that devastates the face of our planet earth, and so on. Why the investigations after the disasters. Why the late flurry of activity to regulate after the fact? Who pays the bills for lost lives? The dots cross over into the financial world. it’s always profits before safety. We need and want the energy. We have the resources to do the research to prevent the casualties, but as a nation we have historically sanctioned the idea of profits first; when will we get up the mindset or the will to consider the general welfare of our people first? Thanks Ekos 2 for bringing these issues to our attention. Editor’s note: Jeanette Malinow happens to be my mother. We would publish this astute comment even if she were a stranger. You may be able to see the roots of what I learned from her in my writing. From my father I learned about economic justice. From my mother, a love of nature and much more. Based upon a written testimony submitted by Washington Gas to the Public Service Commission June 1, 2009, “The Chillum site is intersected by two interstate transmission pipelines, two high-pressure interstate pipelins and three medium-pressure distribution pipelines, all owned and operated by Washington Gas.” Based upon a review of a map of the transmission lines also submitted, two of these are 18″ and 22″ which come from the north (Rockville area), and two are 24″ and 12″ which come from the south (through the Northeast quadrant of Washington, D.C.). Bottom line is that many thousands of people are living in this densely populated city and suburb along highly dangerous pipelines without knowing how safe or unsafe they might be. It is ironic that federal laws require that the public be made aware of old underground gasoline storage tanks, but don’t require that we have information about huge natural gas transmission lines, which pose far greater life and safety dangers as we’ve now seen in the case of San Bruno CA. The state and federal regulatory and monitoring systems are deeply inadequate. Calls to reduce government need to be modified to pleas for “reorganization” so that critical oversight agencies can improve their work of inspecting the BPs and gas companies in this nation. Thanks for this post. It is long overdue. Thanks to Imani for her long standing leadership in Hyattsville on this critical issue. Thanks also for filling in some of the gaps on the high pressure natural gas transmission lines in such close proximity to thousands of people and a major nursing / medical facility. Clearly Chillum is no place for yet another risk ridden venture — the proposed LNG. Editors’ note: Curtis Gray is a former Washington Gas Company inspector and whistle blower. He has raised many issues about the safety of aging transmission lines in the Chillum area and in the Washington DC metro area as a whole. Ekos-squared continues to work with Curtis on gas-line safety issues. Stay tuned for more. Some of the distribution pipe is not even steel it is cast iron from the 1930’s which is patrolled every 3 months just to see no one is working on or near it.